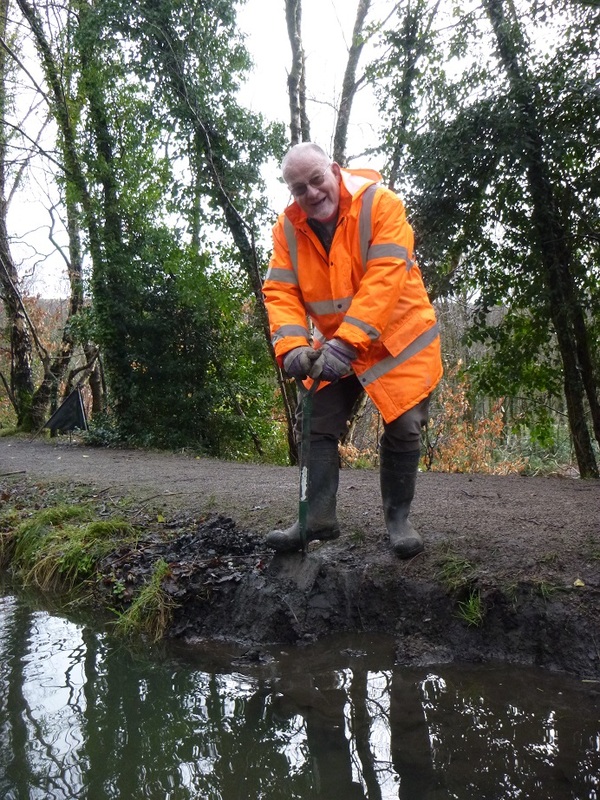 This week we returned to Coed Gwylim Park in Clydach to continue the repair and rebuilding of the canal bank along the towpath. 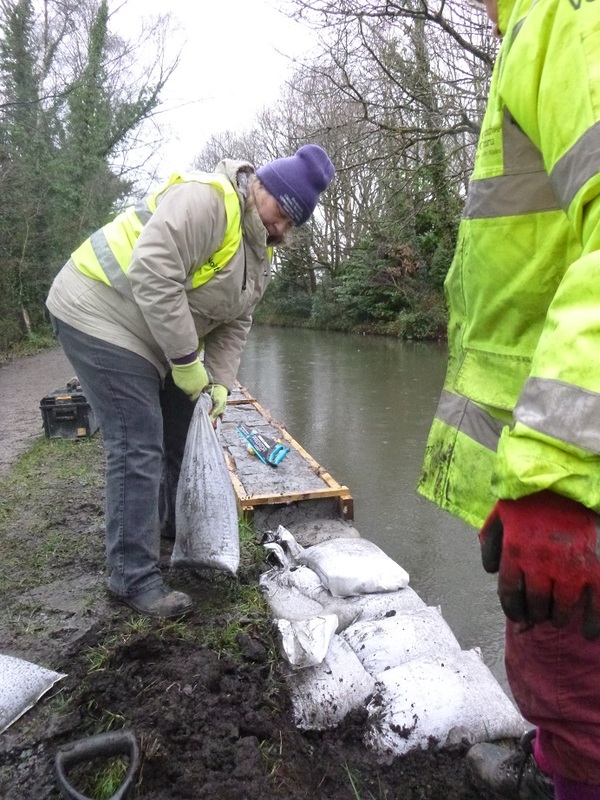 The weather was overcast and there was a brief shower of rain but it did nothing to dampen the enthusiasm of the twenty volunteers who appeared on site. 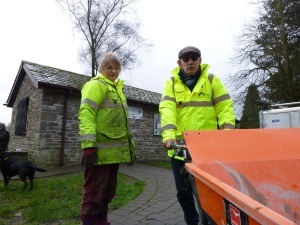 We were visited by Jade Hester and Kevin Phillips of the Canal & River Trust. Both are very supportive of the work of the Canal Society volunteers, and were warmly welcomed on behalf of the society by Gordon. Kevin is the Co-ordination Supervisor of the CRT, and had come down to agree a plan of work for the coming year. 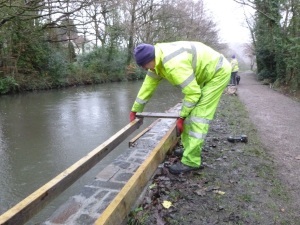 Meanwhile, a team of volunteers set to work on the re-building of the canal bank. This involves using wooden shuttering to contain a base of concrete that is topped off with random stone and careful pointing. 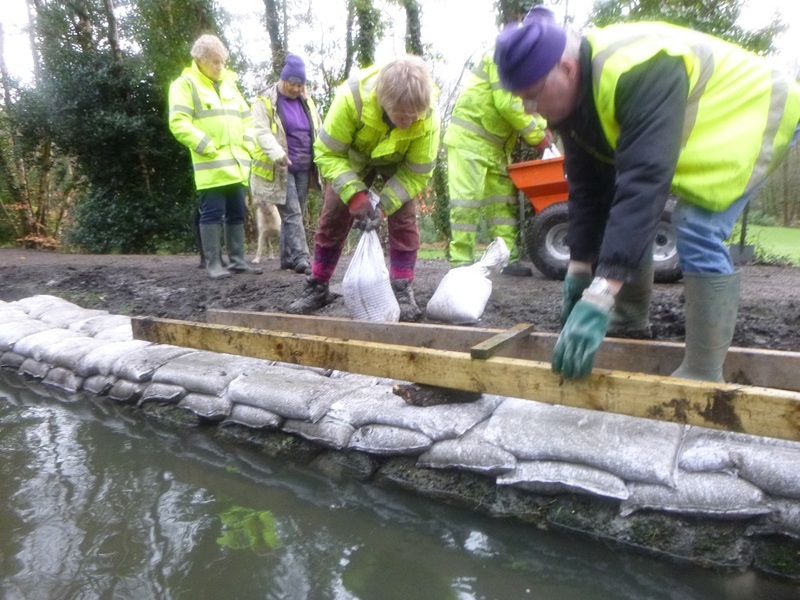 At the beginning of each working party the shuttering from the previous week is removed from the concrete and advanced further along the bank. This week, we concentrated on laying bags – about eighty! – to build up another section of bank ready for capping next week. 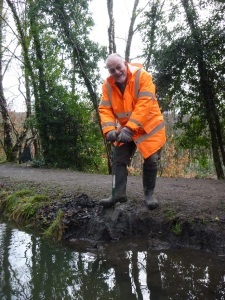 And finally, John Davies is eagerly preparing the canal bank for the next section of shuttering. David (‘Di Barrow’), our powered barrow driver this week, was kept on his toes transporting the filled sandbags from the mixer to the work site. The team managed to construct over 4 metres of wall this week, as well as preparation for the next work party. Some of the volunteers did a great job putting plants into the off-bank. 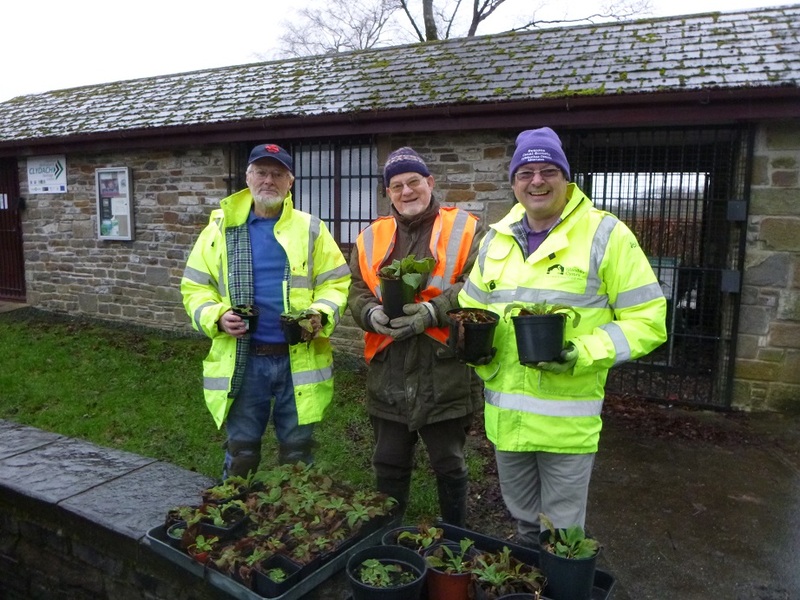 The lovely photo shows the delight on the faces of Martin, John and Mike as they inspect the 20 Alliums and 32 Foxgloves plants prior to planting. 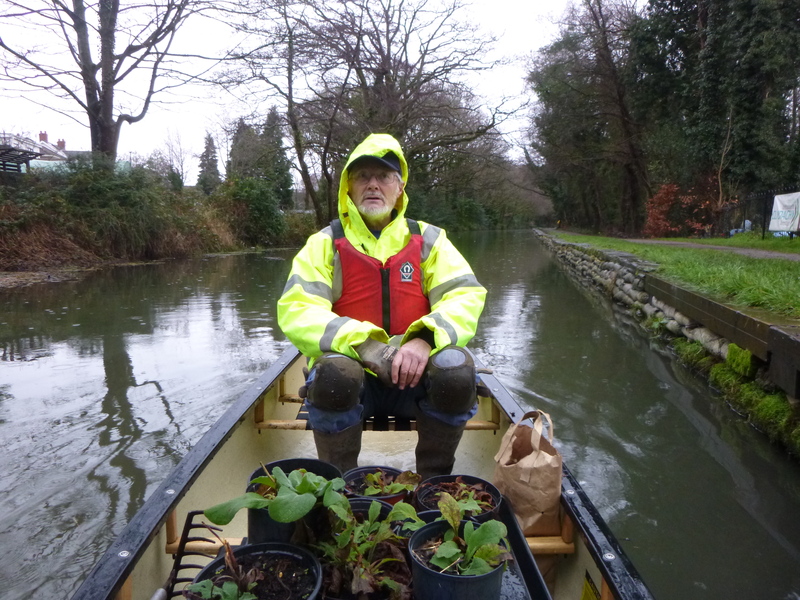 Martin (‘green fingers’) was ferried across the canal to the off-bank and is seen skilfully planting the Foxgloves. The plants will be a delight to see in a few months. 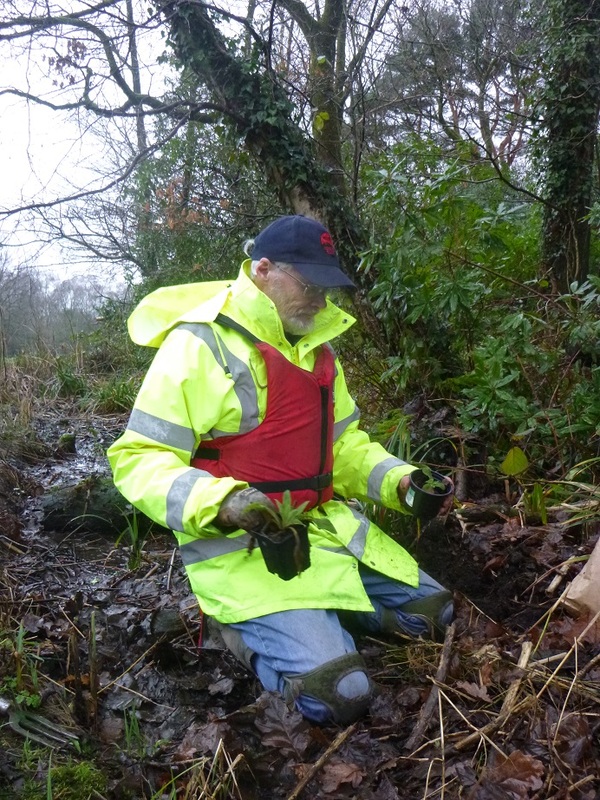 Also this week, litter picking was carried out by John and Mike on land and from a canoe. 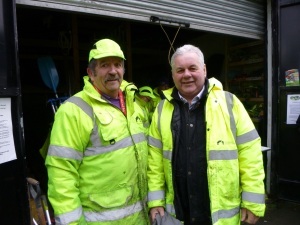 A great effort was done by all and, as coffee, tea and refreshments were taken, the rain stopped and the sun came out. What great work the Swansea Canal Society is doing. And not one piece of litter visible anywhere in those pictures.